Happy Thanksgiving to everyone! What a beautiful day! 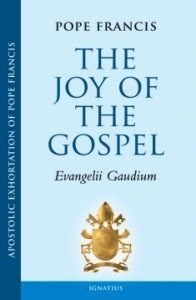 The Pope’s new document is called “The Joy of the Gospel” or “Evangelii Gaudium”. The link above is the document in PDF form. That makes it easy to download to an iPad or iPhone or computer for smooth reading. These papers (called an Apostolic Exhortation) are usually released as summaries of a synod …. a bishop’s council. They are sort of “everything and the kitchen sink” type of documents that touch on all the topics that each of the bishops brought up during the meeting. This one refers to the October 2012 synod that discussed the new evangelization. But, unlike previous papers, the new Pope decided to use the topic as an opportunity to speak out more about his own vision for everyone to go out and evangelize. Chapter 1 and Chapter 5 …. the first and last chapters … really allow Pope Francis to speak in his own, more folksy style. The middle chapters are where he touches on the bishops talking points. But he still gives them his own unique touch. He talks a lot about Christian joy that we must have in evangelization. The quote that jumped out at me the most at first glance that really speaks to the Pope’s simple approach was “an evangelizer must never look like someone who has just come back from a funeral” Ha ha! I think everyone can relate to that image. The paper will also be released in book form in just a few weeks. This weekend, we continue our journey towards Christ with the beginning of our liturgical year. Today, the 1st Sunday of Advent, marks our liturgical “New Year,” which appropriately begins with our preparation for and anticipation of receiving the gift of Christ at Christmas. The Nativity of Our Lord marks the beginning of Jesus’ earthly life, the life of Our Savior that leads to the salvation of the world. The remembrance of these events is intended to help us all re-focus on Christ and His Church by entering more deeply into the Mystery of the Incarnation: God becoming Man. The first step in preparing to receive Christ fully was heralded by John the Baptist, Jesus forerunner, who preached repentance and forgiveness of our sins in order to "prepare the way of the Lord." In that regard, the Diocese of Lafayette is once again sponsoring “The Light is on for You” campaign. All church parishes within our diocese will have their “light on for you” on Wednesdays from 6:30 until 8pm for Confessions. Confession is a beautiful sacrament often under-utilized by Catholics. Confession gives us God's Mercy, which we have discussed over the last few months as not only granting us forgiveness of our sins, but also the Grace to overcome them and live a life fully in union with Christ. As the words of absolution say, God grants us "pardon and peace." Confession allows us to tangibly experience God’s mercy in the forgiveness of our sins, and His Grace gives us the strength to cast off the burden of sin to live in true freedom and know Him ever more deeply. Confession will prepare us to receive Jesus more fully at Christmas, so I hope we all take advantage of the Sacrament of Confession during the Advent Season. Please know of my prayers that all of us are blessed with the greatest gift of all at the end of this Advent Season, the gift of a deeper relationship with Christ! On all Wednesdays of Advent---December 4th, 11th, and 18th—from 6:30-8:00pm, we will be offering confessions here at St. Landry, together with all the Catholic parishes in the Diocese of Lafayette. This outreach is called “The Light is On For You,” and is an effort on the part of our Diocese to highlight the importance of the Sacrament of Confession in the life of Catholics and to make it as easy as possible for every Catholic to come or to return to this great source of God’s mercy and healing love. You are welcome to come here or to go to any other Catholic parish in the Diocese. Please make plans to come yourself and please invite others to take advantage of this great opportunity to be reconciled and begin anew your journey in faith this Advent. St. Francis says that it is in giving that we receive and what better way to give than to give of our time and share in our Faith. This Saturday is Outreach Saturday and as always we invite all able bodied parishioners to join us this December 7th as we spread the Gospel of Hope to those in our community. Please consider in this time of giving, Christmas, to experience the gift of giving. We will follow the usual schedule. If you are not familiar with the schedule, please call the office at 942-6552. The bulletin for the week of December 01, 2013 has been posted. Click here to see it. The current week's homily is available on a link on the front page of the website next to the link for the current week's bulletin. On the page with the prior bulletins, the corresponding homily will be sitting side by side with its bulletin. We started on the anniversary of the start of the Catholic Church, Pentecost Sunday --- four years ago. This week, the Solemnity of Christ the King, is our two hundred ninety second!! podcast to be posted. The homily is given by Father James Brady. This weekend we celebrate the Solemnity of Christ the King, the end of the Church's liturgical year. This celebration is a reminder to us that Jesus can help us to overcome any problem we might have if we let Him reign in our lives. The primary goal of our life here on earth is to live with God in eternity in the next life, and as Christians this must be our first priority. We make this our first priority by following God's commands as He teaches us through His Church in Sacred Scripture and Tradition, and by cooperating with God's Grace by living a life of virtue and prayer in Faith, Hope and Charity. No matter what the circumstances in our lives here on earth, we always have the hope of eternal life in heaven, and nothing on earth has the power to take that away from us. Today we celebrate this gift God has given to us, and we renew our resolve to live a life on earth worthy of the eternal life God has promised. Let us praise Christ our King! Thursday of this week we celebrate Thanksgiving. Mass that day will be at 9am and I hope to see you there. Although Thanksgiving is a secular holiday, it is certainly religious in its theme. This year, there is much for us to thank God as a church parish and community. The generosity of so many of our parishioners in volunteering their time, talent and treasure has been such a great blessing to me as your pastor, and I am grateful to God for the blessing that each of you are to me in my priestly life and in the furtherance of the mission of St. Landry Church. The growth of our knowledge and love of God the Father through the life of Jesus Christ, His Son, prompting us to serve all in charity by the power of the Holy Spirit. We are blessed with three devoted deacons and a hard working and dedicated staff who make all the good things happening here possible. Thanks to them and all of you. I am very blessed to be your pastor! My hope is that during this time of the year all of us are able to look back and see the blessings that God has given us as a church community and individually during the year and to thank Him. Of course, some of us have suffered during the year, and many have said "good-bye for now" to loved ones who have passed into the next life. However, even if it has been a difficult year for you individually or as a family, we can still thank God for the hope of eternal life that He has given us, a hope that eases the pain of suffering and death in this world with the belief that we will all be joined together again, without pain or suffering, in God's Heavenly Kingdom. God Bless! The bulletin for the week of November 24, 2013 has been posted. Click here to see it. The current week's homily is available on a link on the front page of the website next to the link for the current week's bulletin. On the page with the prior bulletins, the corresponding homily will be sitting side by side with its bulletin. We started on the anniversary of the start of the Catholic Church, Pentecost Sunday --- four years ago. This week, the Thirty Third Sunday in Ordinary Time, is our two hundred ninety first!! podcast to be posted. The homily is given by Father James Brady. I have received many comments on the homily last weekend on the Sacrament of Marriage. The comments received have been very helpful to me as your pastor, and they also show that there are many people in our community who indeed did have a misunderstanding of the Church's teaching on divorce, remarriage and being properly disposed to receive Holy Communion. Many thanks to those who took the time to provide input to me on the homily. If you want to share the homily with family or friends, please know that the homily is available on our website (as are all our homilies). In this Pastor's Corner, a follow up on a couple of things may be helpful. As mentioned last weekend, a civil divorce, in and of itself, does not make one not properly disposed to receive Holy Communion nor does it change one's status within the Church in any way. We are always saddened by divorce in the sense that we always hope for healthy and happy marriages. However, there are times when divorce is necessary, especially for the protection of children or of the spouse from some type of abuse, or in the case of abandonment. However, the sacramental marriage remains valid regardless of any civil proceedings. A sacramental marriage can only be annulled in a church proceeding. It saddens me that some might think that the church is not there to help and support them through a very difficult time in their life, or that the Grace and strengthening power of the Eucharist is not available to them during a time when it may be most needed. The annulment process is available to all to explore, and should be completed prior to any remarriage. Not all marriages can be annulled, as we know that once a sacramental marriage is properly done, it is indissoluble (that is, cannot be undone). Jesus' own words provide the basis for this teaching: "Therefore, what God has joined together, no human being must separate" (Matthew 19:6). The problem of being properly disposed to receive Holy Communion may occur when one makes the decision to remarry while still married sacramentally, or when one contracts a civil marriage or a marriage in another church community. It is important that one meet with a priest prior to contracting any marriage. As always, please know that my door is always open to answer any question you may have about marriage. Regardless of whether one is properly disposed to receive Holy Communion or not, all are members of our church community and are loved as Christ would love them. My desire as pastor is to assist anyone who needs information or help in this regard. Please remember to bring this message to your friends and family! The bulletin for the week of November 17, 2013 has been posted. Click here to see it. The current week's homily is available on a link on the front page of the website next to the link for the current week's bulletin. On the page with the prior bulletins, the corresponding homily will be sitting side by side with its bulletin. We started on the anniversary of the start of the Catholic Church, Pentecost Sunday --- four years ago. This week, the Thirty Second Sunday in Ordinary Time, is our two hundred ninetieth!! podcast to be posted. The homily is given by Father James Brady. Tomorrow, Monday November 11, our country celebrates Veteran's Day, a day when we take time to give thanks to those who have served in our armed forces. The United States Conference of Catholic Bishops has requested that a second offertory be made every three years in support of the Archdiocese of Military Services. This year is the year we make the additional offering. Additional envelopes for the offertory are in the church near the doors and at the back tables for your use. The Archdiocese of Military Services provides for the pastoral care of our troops and their families, including chaplain priests in active military zones and at our military bases. The Archdiocese does not have the regular support of a stable congregation of worshippers because our military personnel move often due to changing assignments. This is our way of supporting our troops with the pastoral care that they and their families need. There will also be a Patriotic Rosary sponsored by the Catholic Daughters at 6pm Monday evening in the church. The rosary will be prayed for the intention of all those who serve in the U.S Military, elected officials, religious and for each State of our Union. In this way, we support our troops with prayer. All are invited to join us for this event! We should all give thanks to God for the sacrifices our veterans have made for each and every one of us. As we are reminded every time armed conflict occurs in our world, in order to protect individual and societal freedoms, including the freedom to practice our faith, an armed force is often necessary. We are thankful for the brave men and women who have served, or are currently serving in our armed forces, and we pray for them and their families. John's Gospel tells us: "There is no greater love than to lay down one's life for one's friends." We thank God for raising up these men and women who are willing, if necessary, to lay down their life so that others have the opportunity to live a life in freedom and full human dignity. We pray that God will continue to bless our country, and that He bless our veterans and keep them in His care. May we always appreciate what they have done for us! The bulletin for the week of November 10, 2013 has been posted. Click here to see it. The current week's homily is available on a link on the front page of the website next to the link for the current week's bulletin. On the page with the prior bulletins, the corresponding homily will be sitting side by side with its bulletin. We started on the anniversary of the start of the Catholic Church, Pentecost Sunday --- four years ago. This week, the Thirty First Sunday in Ordinary Time, is our two hundred eighty ninth!! podcast to be posted. The homily is given by Monsignor Louis Melancon.